This decal offers enough decals to make five options for two Islanders. The common theme is that they were flown by Wings Over Whales based out of Kaikoura. 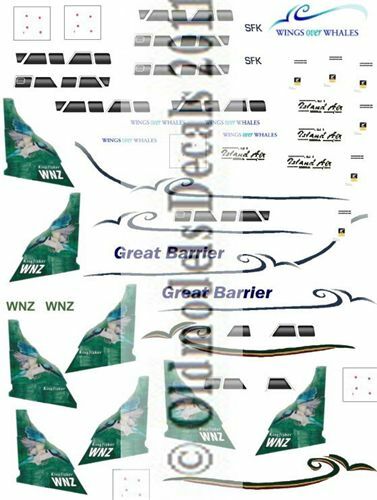 SFK went on to fly for Mountain Air (see NZ sheet 3) whereas this sheet covers WNZ's earlier life as part of the Great Barrier Airlines fleet (where the bird tail originated) and its subsequent demise in a muddy landing in Tauranga harbour whilst flying for Island Air based at Tauranga.